As physicians become increasingly interested in entrepreneurship, it is important that they first understand the different elements of the entrepreneurial ecosystem. Recently, I had the opportunity to sit down with Darshana Zaveri, a partner at Catalyst Health Ventures, a Boston-based fund that invests mainly in medical devices and recently made an investment in the Otolaryngology space. Darshana discussed her firm’s role in the start-up life cycle and was kind enough to offer advice to physician entrepreneurs on approaching venture capitalists for funding and avoiding common pitfalls that physicians often make. Manan Shah: Tell me about Catalyst Health Ventures and what types of investments you make. Darshana Zaveri: Catalyst Health Ventures is an early-stage healthcare venture capital fund that focuses on technology solutions that solve large problems in healthcare. We work with lots of physician entrepreneurs, many of whom are surgeons. Our particular interest is mechanical solutions to mechanical problems, so we invest predominantly in medical devices. Our expertise is in assisting to develop the design and engineering of a device. We also will invest in diagnostics, which make up about 20% of our current portfolio, and we sometimes invest in research and development tools for scientists. We have been investing in healthcare for 14 years now through 3 funds, the last of which we just closed last December. Josh Philips and I source and manage all of the deals and opportunities, and we have about $100 million under management. Manan Shah: What are your thoughts on physician involvement in healthcare entrepreneurship? Darshana Zaveri: I think physicians should absolutely be involved. There is a lot of emphasis on savings and money in the healthcare system today, but at the end of the day, it should be about the patients, and most physicians truly care about and understand their patients. They know what the clinical needs are and should be involved in finding solutions. In fact, whenever we see an area where a physician has jerry-rigged a solution to make a procedure work, it is a sign to us that it would be a great area to invest in. When we are considering a new device investment, a large part of our due diligence is discussing the concept with physicians we know and trust. Manan Shah: When is the right time for physician entrepreneurs to approach early angel or venture funds? Darshana Zaveri: There is no easy answer to that, and there’s a lot that rolls into what makes for an attractive investment opportunity. At Catalyst, we are willing to start the dialogue early, and I mean as early as just having a concept and a PowerPoint, as long as the concept is innovative, feasible, and most importantly, it must improve clinical outcomes and reduce cost. In terms of clinical outcomes, it cannot just be that your imaging technology provides two times more clarity than what is out there; in order for us to want to invest, you have to fundamentally change the clinical paradigm. Most physicians are able to articulate this clinical value, but one area where we see a lot of entrepreneurs stumble is articulating the economic value. You do not need to have an Excel model, but you do have to have a back-of-the-napkin idea of how much your innovation will cost, how much it will save the system, and how many people it will help. On the other hand, you do not need to have nailed down every part of your business plan, or have all the answers to the FDA regulation, and the right team. Part of our job is to help you put those pieces together. The most important thing is the concept, and the product has to be cost saving and very innovative. Manan Shah: What are some other common pitfalls that physician entrepreneurs make? Darshana Zaveri: We are based here in Boston, which is a Mecca for doctors, and we are lucky to interact with extremely bright physicians. One common frustration I have is when a brilliant clinician brings on a subpar CEO, or worse yet, brings on a good CEO but does not allow that CEO to direct the company. When we take meetings with them, it is hard for us to determine who is driving the company, and that uncertainty concerns us. Often, entrepreneurs make the mistake of just partnering with a hired gun, or any MBA, because they think they cannot attract someone better at this stage. This isn’t true; in the same way you need to convince investors to provide VC dollars, if the concept is strong enough, you will be able to attract strong teammates, and then you have to let them execute. Sometimes these quick partnerships make things worse; if we find a great clinician with an innovative concept without a team, we can find a strong CEO to partner with, but it is much harder to get rid of somebody than to find somebody else. Partnering with someone in a business, be it a CEO, a technician, or a researcher, is like a marriage, and it is a good idea in business to date a lot before getting married. Manan Shah: Do you think physicians should be CEOs of their own companies? Or do you think our training of ‘trusting no one and double-checking everything ourselves’ hinders us? Darshana Zaveri: While there are definitely exceptions, I think it is not always the best idea for physicians to be the CEOs, because sometimes that culture of certainty, particularly with surgeons, prevents you from seeing pitfalls. And it isn’t just physicians, in general, being a CEO is a very tough position, and very few people are good at it. It requires a special mix of personality, experience, and a characteristic that I can’t put my finger on, but I know it when I see it. I think it is far better to make sure you hire the right people, and, once you do, let them do their job effectively. Manan Shah: You recently invested in a medical device in the Otolaryngology space, the Lantos Aura 3D digital ear scanner. Could you tell me a little about the device and how it is as an example of what you would consider a strong investment? Darshana Zaveri: I think the hearing aid space is ripe for innovation and currently is dominated by a few key players. We have seen a few companies entering this space; one had to do with disposable hearing aids, another was an online hearing test, and the direct-to-consumer companies are popular now as well. 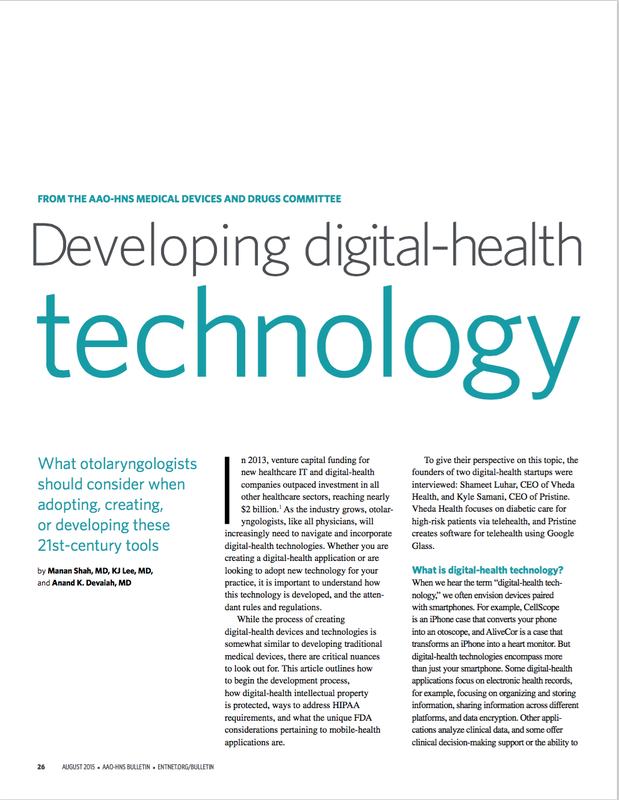 In general, we are leery about technology that leaves the physicians or audiologists out of the loop, because they should be the ones disseminating the technology, and we want them to be our champions. We were the lead investors in a company called Lantos, which created a device that uses 3D scanning to measure the ear canal and improves the process of creating custom ear buds and fitting hearing aids. As an investment, first off, it completely shifts the paradigm, and the hearing aid field is ripe for innovation. The current technique uses silicon putty placed into the ear to create molds, and many audiologists are hesitant to measure deep in the canal for fear of damaging the tympanic membrane. This technology allows for deeper measurement of the canal, and there is a lot of innovation going on for deep-in-the-canal hearing aids. Also, the silicon putty method takes 10 to 15 minutes to fit, whereas the Lantos technology only takes 30 seconds. More importantly, that computer scan can be sent directly to manufacturers, avoiding the time to mail a mold back, so it decreases the time to production and saves the customer time. Lastly, it improves the function of the product itself because it allows for dynamic measurement. Since the ear canal changes shape with movement, the Lantos technology allows manufacturers to see which areas are constant with movement, allowing for a better-fitting ear bud. Ultimately, this allows you to get increased performance and battery life, since you have less sound loss and require less volume. The technology came out of a group of clinicians working with researchers out of MIT, and all the clinicians we spoke with wanted a digital scanner, which we knew was a strong sign. What we also liked about Lantos was there was a consumer angle to it. Audiophiles and musicians use custom ear buds, and companies like Logitech and Skull Candy are interested in driving and expanding the custom ear bud space, so we think there are multiple markets that this one technology can address. Manan Shah: Thank you very much for sharing your time and for the insightful advice. If readers have questions for you, is there a way they can contact you? Darshana Zaveri: Sure. They can visit our website and contact me through there. 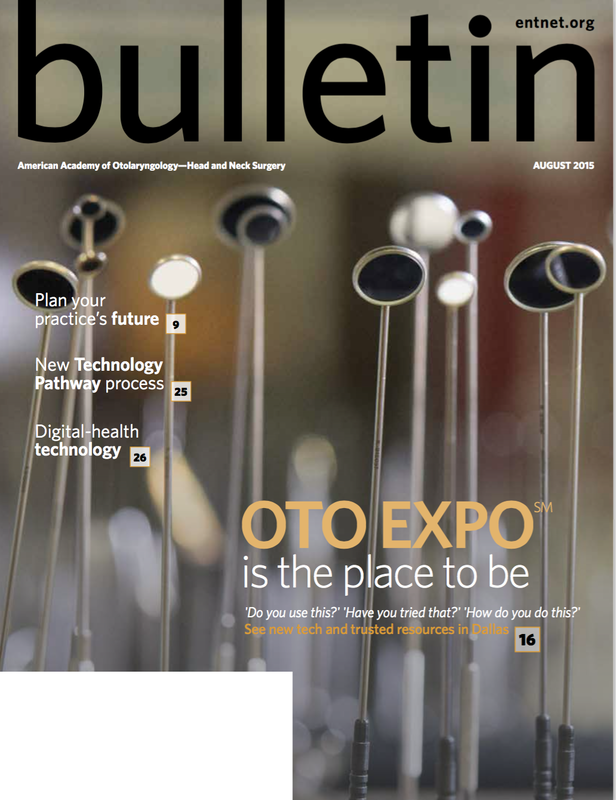 I had the pleasure of publishing an article this month with the AAO-HNS Medical Devices and Drugs Committee on developing digital health technology. 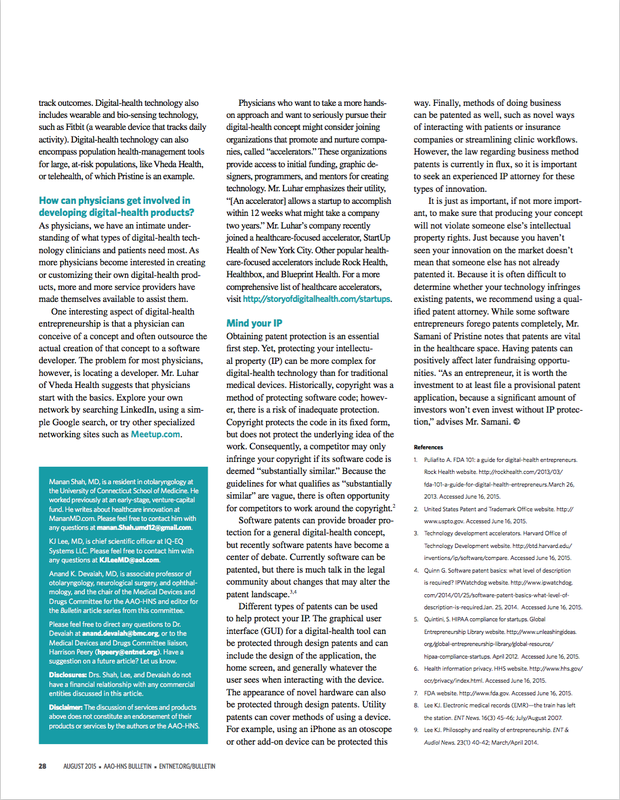 The article outlines advice for entrepreneurs interested in creating digital health applications or technology. It was an honor to work with the chair of the committee, Dr. Anand Devaiah, as well as the esteemed Dr. KJ Lee, who is not only a key opinion leader in our field, but whose textbook nearly every ENT resident reads. I’ve posted screen shots here, but academy members may read the full article at www.ent.org/bulletin. Special thanks to Shameet Luhar of Vheda Health and Kyle Samani of Pristine whose start-ups I am a big fan of. Most of us who are interested in healthcare entrepreneurship are drawn to it because we hope to make a positive impact on the health and wellness of others. Healthcare innovation, however, is not limited to the popular realms of digital health, medical device, biotech, and pharmaceuticals. Recently, I sat down with a medical resident, who somehow found time during his training to co-found a start-up using his medical knowledge. Greg Katz, M.D. took an outside-the-box approach towards healthcare entrepreneurship: he pursued a less-hyped but more traditional method of improving the health of others. Greg created a healthy snack and co-founded a company to offer consumers healthy and nutritious options to turn to. In the interview below, Greg describes why he feels natural food companies are just as important to improving overall health as other innovations, and along the he way provides pointed insights into the nuances of creating a natural food company. What does 2 Armadillos make? Why did you get into this? I am passionate about health. I am a doctor, an avid weight lifter, a hopeful cardiologist, and a former personal trainer. I took a year off during medical school to work for the Dr. Oz show, and during that time, I became obsessed with simple and sustainable ways for people to automate their own healthy lifestyles. After experimenting with natural healthy recipes in my family kitchen, I came up with a chickpea snack that I couldn’t stop eating. I noticed pretty quickly that all of my co-workers kept stealing the chickpeas from me and asking me to bring in more, so I realized I was onto something. Eating healthy is hard for people who are busy, and even consumers who try to eat well are limited by the options available to them. I joined up with my co-founder, Jimmy Edgerton, and we decided to try to make the world an easier place to eat healthy. How does this company align with your mission as a physician? As a physician, I have seen firsthand how food and lifestyle choices are some of the biggest determinants of health status. People are catching on and trying to eat better, but the concept of ‘healthy’ has been completely distorted by the food industry. Most ‘healthy’ snacks today are actually filled with cheap soybean oil or packed with hidden simple carbohydrates. People are limited by what is on the shelves of their local stores, and even when people think they are eating well, often they are being fed over processed junk that has been mislabeled as healthy. As a physician, my goal is to improve health in any way I can, and I think by providing consumers with truly healthy and delicious options, I can make a larger impact than I might otherwise when interacting with one patient at a time. How did your medical training help prepare you for entrepreneurship? Besides providing a strong background in physiology and nutrition, a medical training can both help and hurt you in a business. One of the great benefits is it provides you with a rigorous framework in which to approach problems in a systematic way. The constant ups and downs of an early start-up require you to regularly make snap decisions with limited information, and often on little sleep. Most will agree that medical residency trains you to do just that. On the other hand, our medical training stresses adhering to rules and protocols and minimizing risk. In business, you need to do just the opposite: take risks and embrace unconventional and imperfect solutions. Initially, my background in medicine made me uncomfortable with this, but I quickly learned to accept these gray areas. Overall, medical school teaches you the discipline to work harder and longer than you initially thought you were capable of, and this is invaluable when starting your own business. Besides all the typical challenges of starting a company, which are well documented in blogs all over the web, what are some challenges that are specific to starting a natural food company? First, converting a small-batch recipe to a product produced for the masses is not as simple as adding ingredients in greater proportions. It involves a bit of trial-and-error, chemistry, and a good deal of patience. Like any industry, there are a number of requirements that in retrospect may seem straight-forward, but if you haven’t done it before, can cause you to stumble. My overarching advice is to speak with everyone you can who has started a similar company. Read the small print on every government website, like the USDA and FDA, that might be associated with your industry. A good place to start is speaking with a lawyer who has knowledge of your industry. With the natural food market, there are number of certifications to consider, and the process is different for each. First, you need a food handler’s license. Next, for every label you add to your packaging, there are USDA obligations that must be met. For example, there are requirements for calling yourself organic, for using the labels high fiber or low fat, and, in general, for any way you describe the health benefits of your product. It is amazing to me that in spite of these stringent requirements, manufacturers are able to continue to label foods as healthy that are factually not. Next, you must undergo inspections by the health department, and all of your ingredients must be purchased through certain approved suppliers, depending upon the certification superlative a product hopes to achieve. That sounds complex; how did you navigate all of this at first? I recommend seeking out a shared kitchen space. It is the food analog to a start-up incubator. Small manufacturers use a shared industrial kitchen to help start their business. We started out working in a place called Union Kitchen (http://unionkitchendc.com), and for months that was where we made our snacks. There were lots of resources for us, and we were surrounded by other entrepreneurs who were at different stages with their food start-ups, and everyone was willing to share their advice. The initial network we built and the support we received were extremely helpful to our success. What did all of this cost, and how did you pay for it? Jimmy and I have each invested money to finance our expansion every step of the way. We have also reinvested every cent we’ve made back into the business without taking any profit or salary. For entrepreneurs interested in jumping into this space, the costs are pretty variable depending on what you want. However, you can do a lot of it serviceably, if not perfectly, on your own, if you are willing to take the time. For example, to set up our own custom website, it would cost approximately $10-30,000, depending on how much customization we wanted. Instead, we decided to go with Shopify’s business template (shopify.com). They handle all of our transactions, and we pay $158 per month. They take 3% of every sale we have online, but it was an amazing tool for someone, such as me, without the coding background to make a website. Similarly, in our business, there are consultants for every aspect: marketing, social media, search-engine optimization etc. These consultants can cost around $1,000 per month. We decided to instead learn how to do this ourselves, and we have learned a great deal and have been relatively successful. I recommend reading resources like ‘The 22 Immutable Laws of Marketing’ (http://www.amazon.com/The-22-Immutable-Laws-Marketing/dp/0887306667), the blog of Tim Ferris (http://fourhourworkweek.com/blog/), and Inc. Magazine (inc.com). If you can spend the time yourself, you can be very successful on a lean budget. Lastly, legal costs are on the order of thousands of dollars, but not tens of thousands. Everything will have a separate cost, such as obtaining trademarks, copyrights, setting up the legal entity of the business (we chose an S-Corporation). In general, my rule of thumb with regards to legal costs is that it takes longer and always costs a little more than you hope and expect. As consumers become more interested in their personal health, the nutrition and wellness market is growing. The organic product market in the U.S. increased to $35.1 billion in 2013, which was an 11.5% increase from 2012. Based on your experience in this market, what areas do you expect will have the most growth? The nutrition market is definitely growing. People are doing a much better job of taking control of their health and demanding more of the companies they buy food from. The biggest areas are gluten-free and paleo foods. The paleo diet was the most searched-for diet in 2013. What are some of the key differences between a tech-based company and a food company? The main difference is we have an actual, physical product that we are selling, and you don’t have to imagine where our revenue will come from. That said, in a fast-growing food company, so many variables can change, so it is often difficult to identify inflection points when planning and budgeting. We are constantly growing and changing the scale of the raw materials we are purchasing and are continuously switching our processes to maximize our efficiency and quality. These changing variables often force us to sacrifice short-term profitability in pursuit of growth, which is key for our company to achieve financial sustainability and positive impacts on people’s health. Another interesting variable is that from a company standpoint, we require a different employee skill set than the traditional tech start-ups. Like many companies, finding and retaining good people is the biggest challenge. For a snack company in particular, many of the jobs require manual labor, such as packaging, cooking, and labeling. On one hand, this has allowed us to employ people who otherwise had difficulty finding jobs in this tough economy. We love this, but it also creates a challenge of learning how to motivate and manage in different ways. Jimmy is amazing with this due to his experience working with all types of people during his construction and development experiences, and it is one area where his background gives him an edge on perhaps your standard MBA student who maybe doesn’t have experience with field/floor jobs and managing a variety of types of teams. From a business standpoint, are there companies similar to yours that have been successful? Jimmy and I are absolutely committed to this company and are willing to take it all the way. To us, success is when high-quality oils, such as olive and coconut oil, become the norm and not the exception in snacks, because consumers demand delicious, healthy food that helps them to be happy and productive. From a business standpoint, there are historical precedents of natural food companies with aggressive growth strategies ultimately being acquired, which is one way to measure success. For example, we are trying to follow in the footsteps of Sabra, Honest Tea, and Stacy’s Pita chips. Before we close, what is one important lesson you can offer to other entrepreneurs in your space? One important lesson that I learned is if you have a big rush of publicity and it gives you a one-time boost in orders, you don’t need to change everything about your business. We were fortunate enough to go on NBC’s Today Show in Q1 of 2014 and ultimately won their ‘Start Up to Success’ challenge, which featured Marcus Lemonis of CNBC’s ‘The Profit.’ It provided lots of publicity, and it gave us a large boost in orders. We were tempted to change everything in our business to capitalize on that demand, and I think we expanded production more quickly than we should have. In retrospect, we should have expanded based on our consistent volume, and not just on a one-time boost. I’ve learned that we could have instead communicated with our customers to let them know we were experiencing a rush of orders and that it might take us more time that normal for our product to reach their doors. We may have lost some customers, but it would have kept our growth stable, which would have been better in the long term. Expanding too fast can hurt just as much as not growing, because you take on increased financial risk. Thank you very much for sharing your time and for the insightful advice. If readers have questions for you, is there a way they can contact you? Sure. 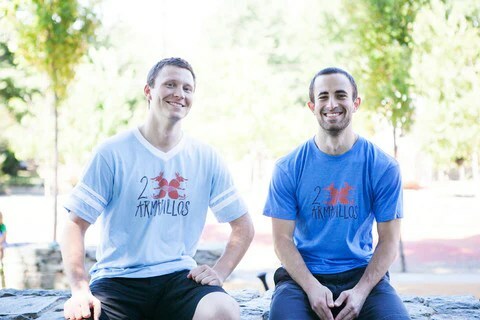 They can visit our website and contact me through there (http://www.2Armadillos.com). Learn more about Greg Katz, M.D. and 2Armadillos Snack Company and be on the lookout for their new certified USDA Organic line of snacks! See article above: Excited to see that medical device venture investment is picking up. It has been a big month for the space after the end of the JP Morgan Healthcare Conference and a number of new Lifescience investments have been announced (ex: Obalon Therapeutics $20M, Apama Medical $11M; and of course Moderna Therapeutics’ historic $450M financing). One area that I think is exciting is the neuromodulator space. It has been growing, and in my time in VC, I saw a company working on a diaphragmatic stimulator for ALS, just last year the FDA approved the Inspire device for stimulating the hypoglossal nerve for sleep apnea, and recently the FDA approved a neurostimulator device for obesity, the Maestro system. What is interesting to me is the market and physicians are willing to utilize implants for increasingly less dangerous diseases. No one batted an eye at pacemakers because they are a life-saving device. When the lap-band debuted there was market hesitation because it was an implant for a purely lifestyle disease, but it gained acceptance quickly, and I think part of what sold consumers is that it is an easy to understand mechanical device that works by limiting gastric expansion. What is different about the Inspire hypoglossal nerve stimulator device for sleep apnea, and the recently approved Maestro obesity neuromodulator device, is that they act electronically on significant nerves and alter neurophysiology in complex and not fully understood ways. Also, this is for diseases that can otherwise typically be cured by lifestyle modifications. This suggests that device makers assume consumers are interested in tech implants that don’t just save their life, but make it better, and I think this is related to the trend towards wearables. The implications of this are twofold: 1) entrepreneurs are increasingly less limited by technology, and instead can focus more on finding/solving significant clinical needs 2) the lines between tech innovation, wearables, and medical device innovation are increasingly blurred. Entrepreneurs will need to diversify their teams accordingly, and more and more software and hardware backgrounds are relevant to life sciences and this is supported by Google X making large inroads into medical device. The NYT ran a cover story today that posited that VC’s are ‘returning’ to science-based start-up’s, but there was nearly no mention of life-science or biotech companies. Regardless, it was nice to see a headline about venture that didn’t include the words ‘tech’ or ‘social.’ Truthfully, VC’s never stopped investing in science-based start-up’s in the biotech/life-sci space, albeit they have had a smaller appetite of late. Linked below is a concise but strong post that addresses key issues HealthIT entrepreneurs face when trying to validate their innovation. Because many health apps incorporate HIPAA protected data, it makes even basic studies tedious. The incredibly slow pace of IRB committees further complicates this. Finally, the specter of the FDA studies scares even the most passionate founders away. Ultimately, until there is some type of reform or alternate pathway for more technology oriented healthcare innovation, we will continue to see major companies avoiding the healthcare space. We saw this recently with the Google co-founders mentioning that they are not interested in healthcare, and disappointingly, yesterday as we saw Apple, after much hype, shy away from any significant healthcare foray with its watch reveal. Until then, we have to keep fighting the good/painful fight knowing that despite these hurdles, affecting patient health is worth it. While the topic of patents is currently controversial in the entrepreneurial community at large, for medical device companies, it is crucial that you utilize patents fully to protect and capture the value of your intellectual property. Filing for utility patents to protect how your device works is obvious, but as this article notes, even the major players do not always understand the potential value of design patents. There is no reason to leave value on the table, and I think the article below is a great read. One key point discussed is how the look and feel of a device can subtly drive brand loyalty. The obvious example of this is how many consumers just prefer the user interface of Apple products over Android products, despite the many benefits that android offers. In the medical realm, I can attest that surgeons are creatures of habit; once they are comfortable with the outcomes they can achieve with a device, they will be hesitant to switch, even to a device that is very similar or even better.